When you're getting dressed for those really cold days, your first priority is most likely figuring out how you're going to conquer those frigid temperatures without legit turning into an icicle. For those of you who spend a solid chunk of your day commuting outside (hey, Londoners! ), you understand the need for a functional winter uniform more than anyone. And while your warmth should always be a priority, it is actually possible to keep any winter ensemble stylish, as well—despite all the layers. To showcase the best outfit ideas of the season, we turned to some of our favourite fashion bloggers who've pinpointed what we all should be wearing. Note that some of the ensembles will work best when it's cold (but not necessarily below zero) while others work better for more extreme temperatures. In other words, there's something for everybody based on the climate you live in. Go on to find your new go-to winter uniform. Plus, shop each, too. Fortunately, puffer jackets are so on trend right now (ideal for looking forward yet staying warm). Pair your favourite style with a printed sweater, jeans and functional accessories like a hat and boots, and you're ready for the day. On Natalie Suarez: Canada Goose Shelburne Parka (£845) and Aviator hat; Cardigan NYC sweater; AG jeans; Dr. Martens 1460 W Boots (£129); Kooba backpack. This will keep you very warm. Need a sophisticated yet warm look? Follow Aimee's lead and pair a furry coat with sleek flare jeans and boots. On Aimee Song: Keepsake pants; For Love & Lemons sweater; Louis Vuitton clutch; Dior earrings; vintage coat. This ensemble is perfect if you're travelling to a slightly warmer country, and you need a look that's a bit warmer but not too much. Go for the athleisure look, and pair leggings with boots and add a hooded sweatshirt with a cool moto jacket. On Katie Sturino: Karen Walker sunglasses; AYR sweater; Stuart Weitzman Go West Bootie; American Apparel Zip Hoodie; BLK DNM Leather Jacket; Eloquii Miracle Flawless Leggings (£63). This will work with any outfit in your wardrobe. A shearling coat is not only incredibly stylish but it's also ideal for any super-cold day—especially paired with an eye-catching sweater, jeans and ankle boots. On Pandora Sykes: Bella Freud blouse; J Brand jeans; Camilla Elphick boots; vintage coat. 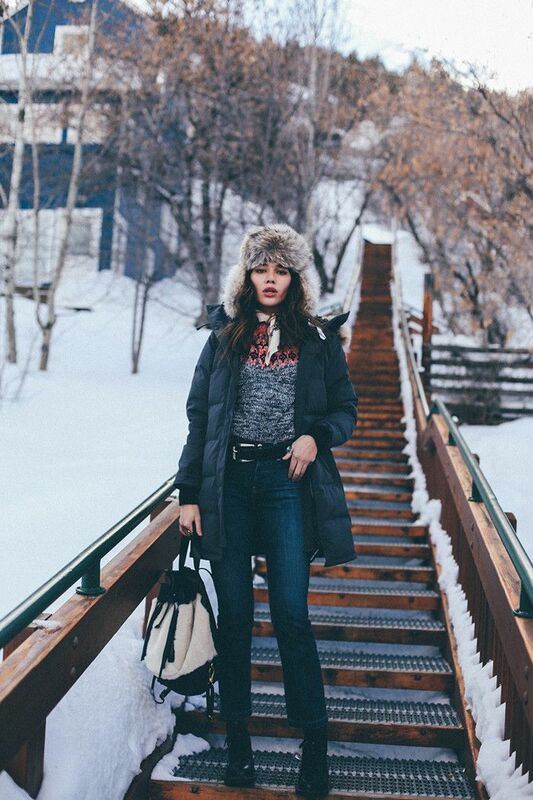 For an off-duty winter vibe, go for a puffer, sweatshirt, statement jeans and sneakers. The cool thing about this look is that it can work if you're in a cold climate (with the jacket) and can work without the coat as well if you're somewhere slightly warmer. On Tine Andrea: Saint Laurent pants and jacket; Weekday Ailin Hooded Sweatshirt (£25); Sun Buddies sunglasses; Vans Sk8-Hi Sneakers (£55). How to do the biggest coat trend of 2016. Need more outerwear ideas? Check out 26 of the best coats for looking seriously chic this winter.